I was just browsing through the internet and came across this! The bottle is just so damn cool. Guess who makes them? None other that Dan Akroyd of Blues Brothers fame. He actually has a distillery that creates wine simply called "Dan Akroyd WInes". From there he brancehd out into the vodka business. however, Crystal Head Vodka is not your average everyday ordinary spirit. It is a pure spirit and is flitered through diamonds!!! The skull bottle is representative of Cinco de Mayo and the premise of hope and knowledge. They are also reminiscent of the Mitchell-Hedges crystal skulls found in the Yucatan during the 1920's. Also, according to most new age philosophies Herkimer diamonds are known toconstantly emit positive energy. 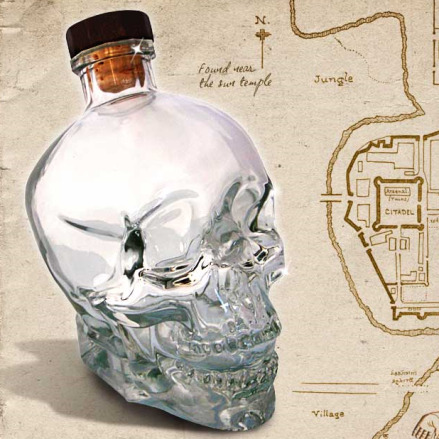 A bottle is a bit pricey for me at $89, howeverm it is just so damn cool that I might just shell out that $89 and just refill the skull with Absolut or water when the original vodka is gone.